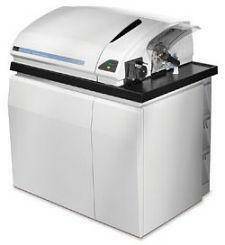 The Elan DRC-e Inductively Coupled Plasma Mass Spectrometer is a powerful instrument for accurate and precise trace and ultra trace elemental analysis. Again, up to 70 elements of the periodic table can be detected and quantified in solution. This quadrupole mass spectrometer is over 100 times as sensitive as our emission spectrometer, capable of sub ppb to ppm levels of analyses in aqueous samples. The technique is especially suited to the analysis of As, Se, and Pb. This unit is equipped with an S-10 autosampler. This instrumentation is capable of performing quantitative analyses on a wide variety of sample types, including water, soil, plants, other biological and organic samples, sediment, rocks, nanoparticles, hydrofracking fluids. Sample digestion is required for all but water samples. In ICP-MS an argon plasma again evaporates the solvent, vaporizes the sample and atomizes the sample. Plasma conditions are optimized to ionize the sample. The ions are introduced into a mass analyzer and separated and collected according to their mass to charge ratio. The intensity of the signal at the selected mass is converted to an elemental concentration by comparison with concentration standards. Analytical and Technical Services analyzes samples from an array of customers including academic researchers within ESF and from other regional institutions, government agencies, and private enterprises. Contact Deb Driscoll at debdris@esf.edu or 315-470-4844 for rate information.